- UHF wireless ID pairing technology, support 10 variable channels, and support multiple sets using in a band simultaneously. - With the output function of the headset, you can practice five effects while avoiding disturbing people around. - The TX supports power saving function. It will be turned off automatically if there is no input signal more than 5 minutes, making it more environmentally friendly. - The RX built-in BT and line-in, background music of mobile phone can input to RX through it. So that one musician could play the effects of a band. - The exclusive Digital Signal Processing technology, compared with the traditional analog technology, is more sensitive to the sound of musical instruments, with lower noise and more personalized. - Class performance on campus within 300 people. The effect is outstanding, sound quality is exquisite, can support many kinds of style small performance. You can play at home parties or enjoy the wireless effector with friends. 10 sets of equipment can be used at the same time without interference. - Practice playing the electric guitar. Portable and easy to operate. 5 effects can be practiced whenever you have an electric guitar and stereo (or headphones). If you want to avoid disturbing people around you, you can choose to output with the headset. - Original Clean: fully present the original sound of the instrument, and add boost incentive function to make the music sound louder and full. - Bluesy: add some distortion and reverberation and the tone is clear and a little bit hoarse, which is suitable for traditional blues music. - Flanger: produces a dreamy tone, with the crystal clear music whirling through the air, constantly circling the beams, making people fascinated. - Tremolo: a classic tremolo effect, feels like the music is the water wave, coming to us in waves and waves. - Metal: the highlight of this product. The high tone is bright and penetrating, the midrange distortion is rough and plump, and the bass is deep and strong. If you like heavy metal, this is what you want! Support Bluetooth Connection: You can press the power button to turn on bluetooth pair mode and connect its bluetooth on phone or other bluetooth-enabled devices. 5 Sound Modes Setting: It allows you to do the following sound modes selections: REV---CHOR--FLAG---OVDR---WAH cycle switching; and sound effect has the memory function and works in the last sound mode and no need for you to frequently to do the setting. 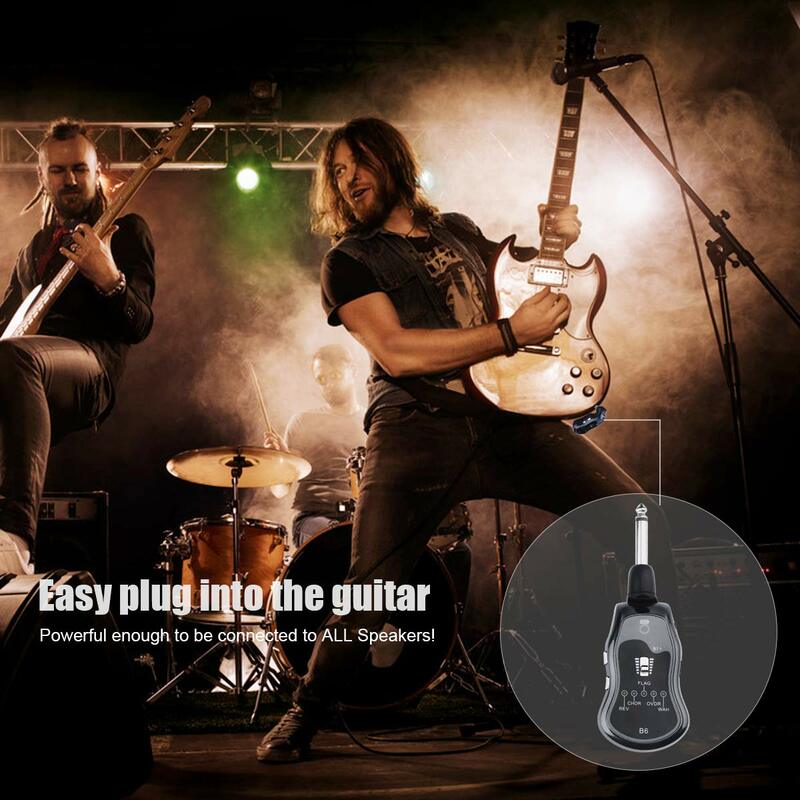 Universal 3.5mm Output Jack: With our 3m long audio cable, you can conveniently connect it to your guitar amplifier or headphone(not included). 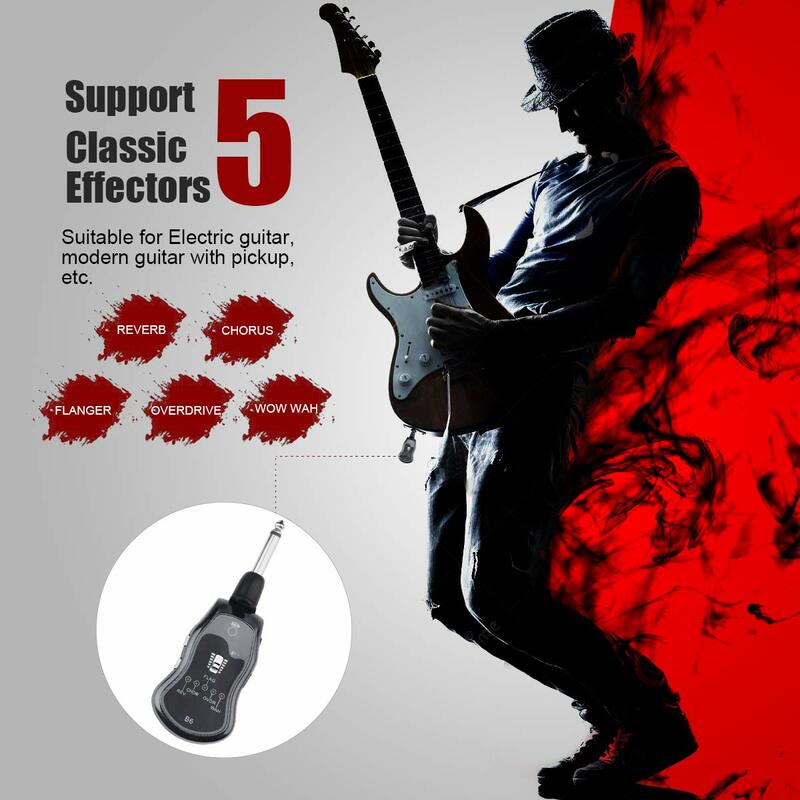 Simple Operation and Easy to Use: You just need to connect it to any bluetooth-enabled device and amplifier or headphone, and then plug 6.35mm into electric guitar, and you can enjoy the fantastic sound from the device and guitar on amplifier or headphone. Super Portable: The appearance is compact and body is lightweight, convenient to store away and carry around, not occupying space. Long Running Time: It has built-in 800mA Li-on battery, standby time is up to 8h. And support USB rechargeable function, you can do fast charging via connecting it to power bank or computer when notice the low power indication.